a while back to perform Sephardic and other music too. 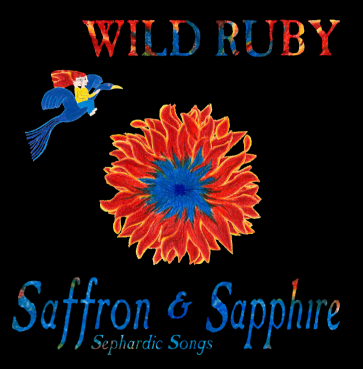 This is a track from our CD, Saffron and Sapphire. I did all the vocals and he played flutes, viol and dumbek. We recorded it at home and hung blankets and duvets on the walls to improve the sound. I remember I had been struggling to get the vocals right on La Serena. Then Andrew began to record this take. The bulky, earmuff style, headphones started to slide slowly down my face. Then he made a silly joke. I can't remember what it was, but standing surrounded by duvets and sliding headphones, I started to giggle and laugh. How ridiculous everything was. By this time, the intro was coming to an end and it was time to sing or stop recording. What the heck, I thought. I sang the take. I liked the sound of it afterwards, so we used it. I hadn't listened to it for years and put it on yesterday. I still like the sound of the track. Is ridiculousness the key to singing? Could be. Lovely singing, and lovely song.